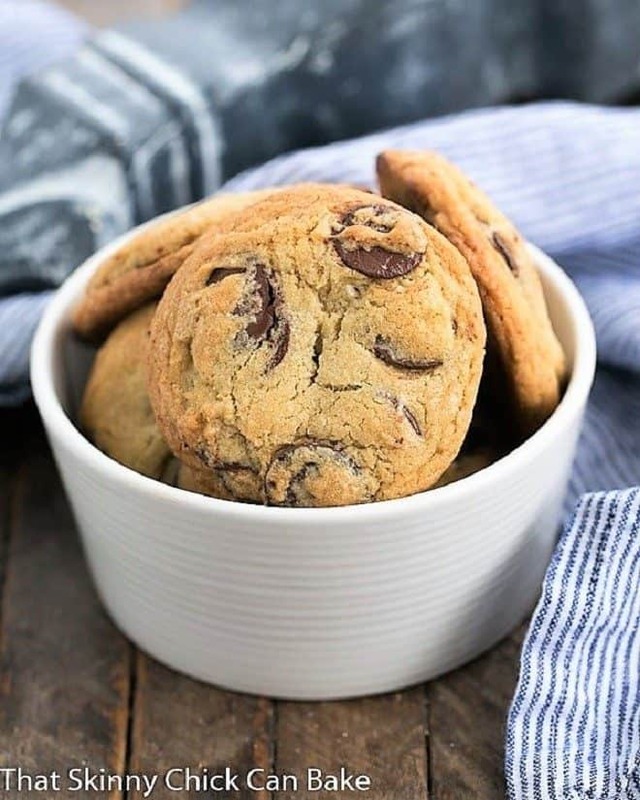 If I had to choose ONE standout chocolate chip cookie recipe from all that I’ve baked, it would be Jacques Torres’ Secret Chocolate Chip Cookies. Perfect in every way! This is the recipe that convinced the hubby I needed a larger KitchenAid mixerlarger KitchenAid mixer for my birthday. He’ll do anything for more chocolate chip cookies. Though fudgy brownies sans nuts are close behind! 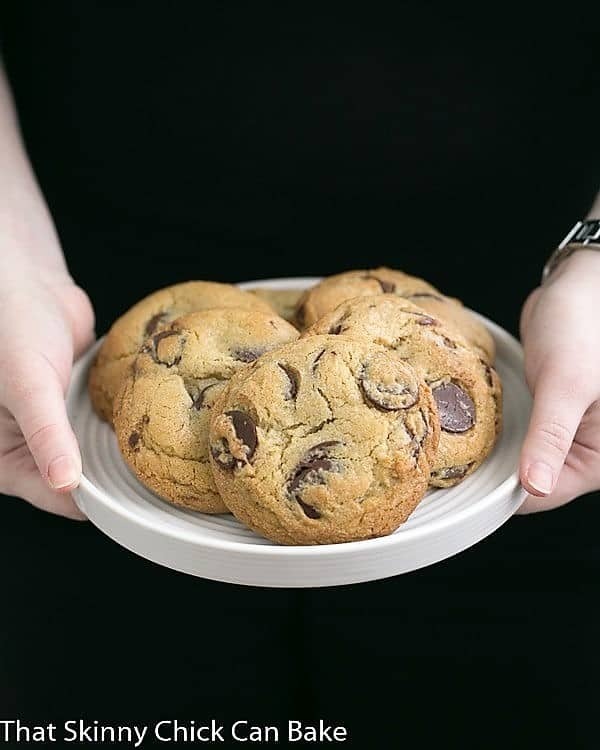 There are a couple secrets to making Jacques Torres’ Secret Chocolate Chip Cookies. First, there is the the unusual combination of bread flour and pastry (or cake) flour instead of all purpose. Also, these are filled with loads of chocolate, but not just ordinary chocolate chips, although those will work in a pinch. But chocolate disks or feves. I find a Guittard version at Sur la Table or Williams-Sonoma. Then there’s the overnight (or longer) chilling of the dough. Up to 3 days is recommended, but at least overnight. Something magical happens during that time. I’m sure there’s a food chemist out there that could give the rationale, but just trust me. They’re worth the wait! Nestles’ Tollhouse chocolate chip cookies sans nuts are the gold standard for chocolate chip cookies in the Berg household. 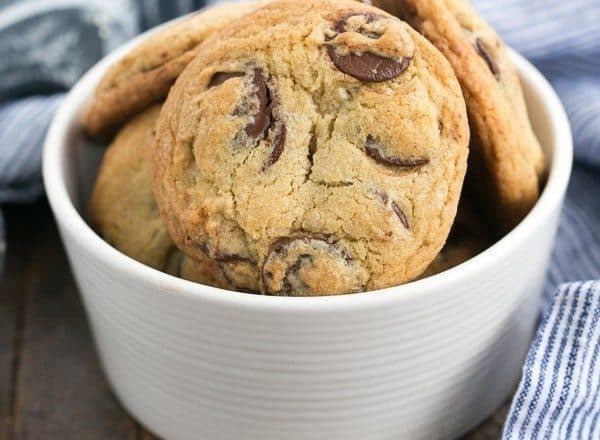 I have tried all the “best” and “ultimate” recipes and none have come close until finding this NYT Cooking Chocolate Chip Cookies recipe. 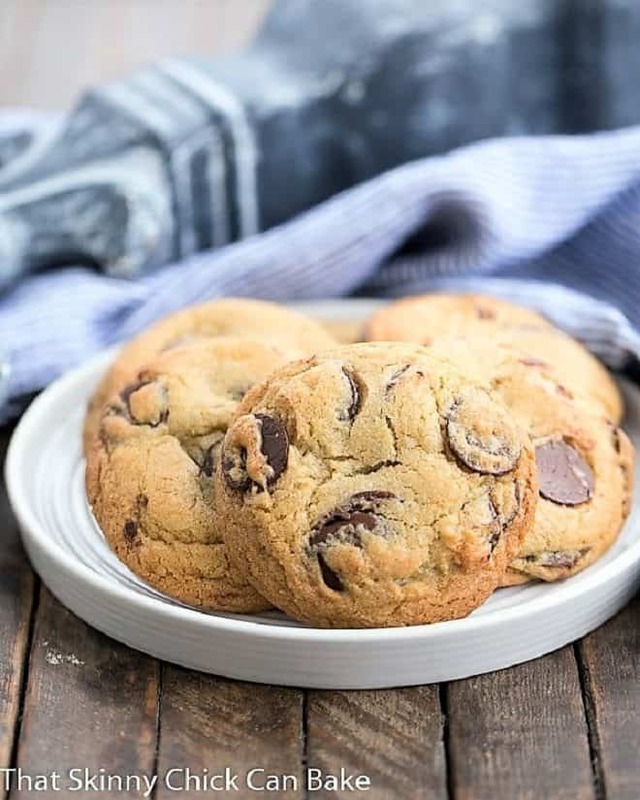 There was a huge buzz among foodies when the perfect chocolate chip cookies recipe first appeared in the Times in 2008. A pound of butter, pastry and bread flour, plus 2 pounds of chocolate discs equals perfection. 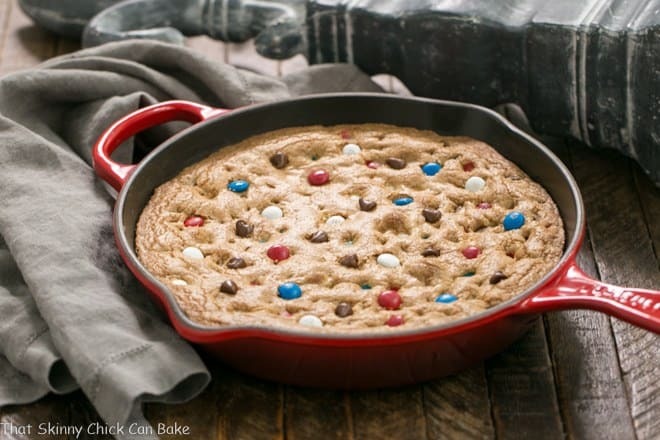 The giant mounds of dough bake into bakery sized cookies with a superb texture. My youngest couldn’t wait until Jacques Torres’ Secret Chocolate Chip Cookies were cool before sinking his teeth into the gooey chocolate. 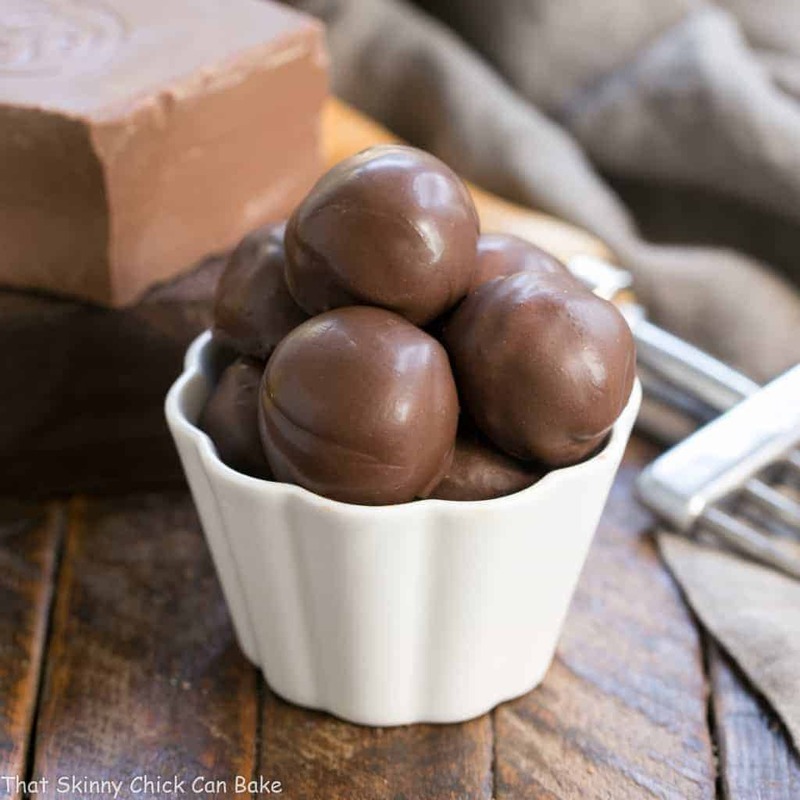 When I first started baking these, I used 3 bags of semi sweet morsels instead of the recommended chocolate disks. I finally found Guittard chocolate disks , but chocolate feves work well, too. Cake flour and bread flour can be found at most supermarkets. They’re another reason these are the BEST chocolate chip cookies. 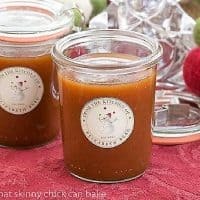 The final product has more caramel undertones with the 72 hour chilling time, but we have trouble being that patient when chocolate is involved! Try for at least overnight. 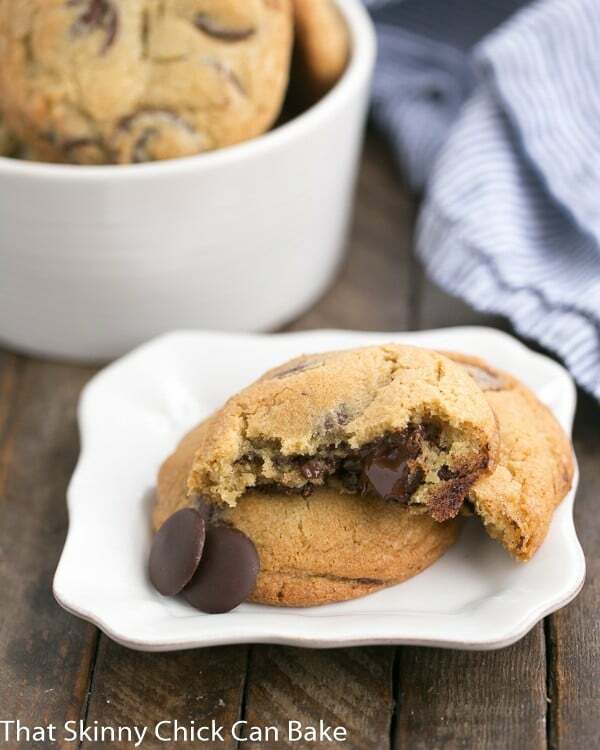 You definitely want to make a batch of the famous Jacques Torres’ Secret Chocolate Chip Cookies!! In the bowl of an electric mixer fitted with the paddle attachment, cream together butter and sugars. Add eggs, one at a time, mixing well after each addition. Reduce speed to low and add both the cake flour and bread flour, baking powder, baking soda and vanilla; mix until well combined. Fold in [easyazon_link identifier="B00UZLMQI8" locale="US" tag="thskchcaba-20"]chocolate[/easyazon_link], making sure to distribute well. 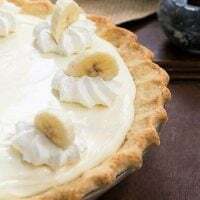 Cover and refrigerate dough overnight or up to 72 hours. Before baking, bring dough out of the refrigerator for about an hour.Preheat oven to 350º. Line baking sheets with parchment paper and set aside. Using a 4-ounce scoop for larger cookies or a 1-ounce scoop for smaller cookies, scoop cookie dough onto prepared baking sheets, about 2 inches apart. Bake until lightly browned, but still soft,18-20 minutes for larger cookies and 12-15 minutes for smaller cookies. Cool slightly on baking sheets before transferring to a wire rack to cool completely. Liz … Alex loves these cookies too! Liz…Those cookies sound great!!!!! My daughter and husband will probably eat the whole batch, they are their absolute favourite. Thanks for sharing. 🙂 Great pictures. I’m moving to your neighborhood so you can throw me a sample now and then, those cookies look a.maz.ing! These look delicious (as do all of your desserts). But where do you find the pastry flour? Thanks! Christina…I just use cake flour…which I can find in the bakery aisle of my grocery store. Swan’s Down or Softasilk are two brands I can find around here. Ok, thanks! I wondered if that might be a possible substitute, but it’s reassuring to hear that you’ve tried cake flour and it worked out well. Your blog is really great – everything you make looks yummy. Wow! These cookies sound amazing! Definitely bookmarking these to try. I want to sink my teeth into them too. 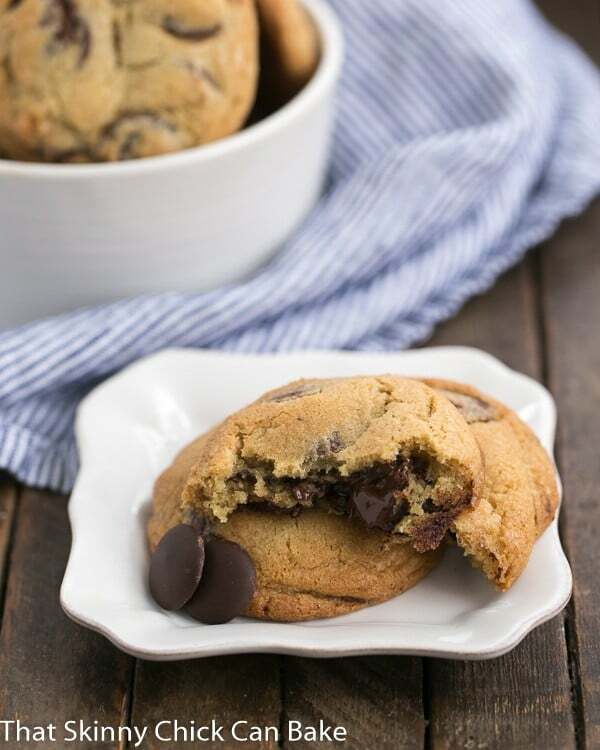 Those look like the perfect, classic chocolate chip cookies. I want some right now! I tend to make Kim Boyce’s whole wheat chocolate chip cookies most often, but sometimes nothing but the classic version will do. Do you use light or dark brown sugar? Hi, Vicki! I was with Suzanne this morning 🙂 I use light brown sugar. Hope you enjoy. 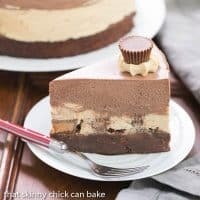 Hi, just came across this recipe and I want to try it. I just want to confirm that there are 2 pounds of chocolate disks used. Therefore 900 grams……I find it high but maybe that´s the trick?!?! Yes, that’s correct! It makes a huge batch of cookies. 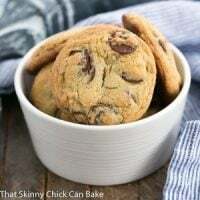 There are smaller batches of this cookie recipe using only 2 cups of both flours and less chocolate chips if you google Jacques Torres Chocolate Chip Cookies. You’ll love these! 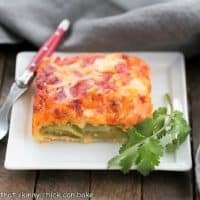 Your post is so well-written and convincing that I will definitely make these. Happy New Year, Liz. Oh my, these look fantastic! You’ve never led me astray so after my January diet I’m making these!!!! Awww, you’re so sweet, Monica. I can guarantee you’ll LOVE these!!! These look absolutely delicious! I’ll have to make these soon. I can see why these stand out above other recipes. They’re amazing! I’m obsessed with this recipe. These are so good! My kids can’t stop eating them! They were so good! My kids really enjoyed them! They were so good!